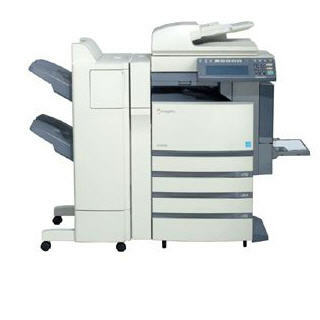 Normally, Office Copiers–the kind that have their own base with wheels on the floor–can be moved by regular movers. If there are no stairs involved, and the copiers are in the 200 to 400 lb range, they can either be pushed on their own wheels out of the office, or into the elevator, or they can be put on a 4-wheel dolly. If there are stairs, it is a little trickier, but not that difficult. In that 200 to 400 lb range, they can be taken down stairs on an appliance-handtruck with a built-in cinching strap. There should be about 3 or 4 men to handle it. If the copier’s collater or “finisher” is the kind that rolls away, then it should be detached, rolled away and taken down by itself. If the collater or “finisher” hangs off the copier, then the handtruck should be attached to the other side. The toner should also be removed if possible. We took down two of these types of copiers down a steep staircase yesterday, and it wasn’t easy, but it wasn’t that much of problem. And the copiers came through fine. This entry was posted in Office & Industrial Moves and tagged Copiers by Bob McGregor. Bookmark the permalink.